1. Place plastic wrap on both sides of a 4 ounce cutlet on a cutting board and using the smooth side of a meat mallet, start from the middle and pound the meat out uniformly to about 1/4″ thin. Do this for all 4 pork cutlets, pat both sides dry with a paper towel, then season with salt and freshly ground pepper and set aside. 2. Arrange two shallow dishes next to a large skillet on the stove. Add a lightly beaten egg in one dish, and the combined breadcrumbs and optional grated cheese in the other bowl located closest to the skillet. Add the clarified butter to the skillet and turn the burner on to medium heat. 3. As the butter starts foaming and begins to brown, lightly dredge 2 cutlets at a time evenly on both sides in the beaten egg bowl, then both sides into the breadcrumb mixture, making sure to shake off any excess. 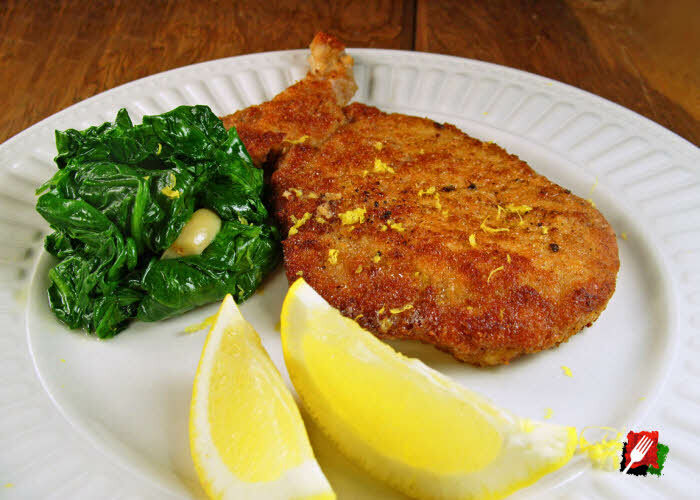 With the clarified butter hot and evenly distributed in the bottom of the pan, cook 2 cutlets at a time uncovered for about 3 to 4 minutes on the first side without disturbing, then turn over with scissor tongs to cook another 2 to 3 minutes on the second side until both sides are golden brown. Do not overcook cutlets. Remove each batch from the skillet to rest on paper towels before promptly plating and serving. Note: Add a little more butter to pan if needed between batches. 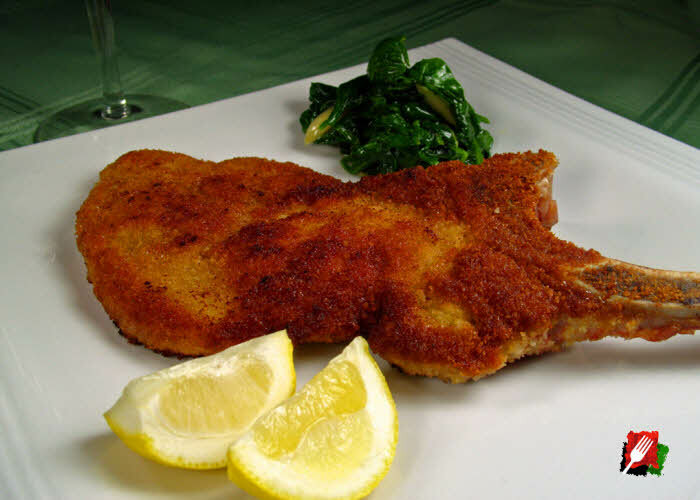 Top pork milanese with lemon zest and serve with lemon wedges, along with an arugula salad, spinach, asparagus, or even a side of spaghetti marinara. 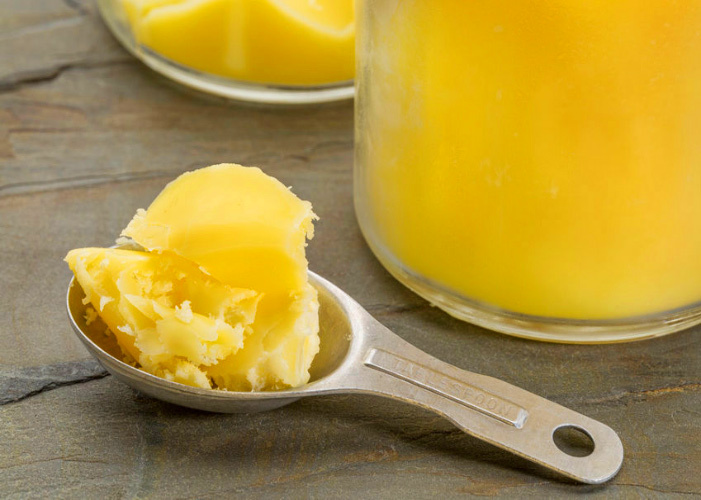 Clarified butter is simply butter that has the water and milk solids removed so it can be used to fry at higher temperatures without burning. This results in a delicious, pure butterfat that also has the advantage of an exceptionally high smoke point, meaning you can use it to cook to 450°F compared to 350°F with regular butter. It is easy to clarify butter at home by heating regular butter in a small, heavy-bottom pan. Cut 4 sticks (1 pound) of unsalted butter into smaller pieces and place in an uncovered pan over low heat. After about 30 minutes, the butter will start boiling with the water and impurities rising to the top, the milk solids settling to the bottom, and the delicious clarified butter in the middle.